In October 2014, we introduced Office Sway to the world as a brand new app joining the Office family. It’s been inspiring to see the variety of ways people have used Sway in their educational, professional, and personal lives. People all over the world tell us how excited they are to quickly create and share their ideas with a variety of multimedia using Sway’s polished, interactive, web-based canvas. Sway Preview has been an awesome journey as we’ve been listening intently to our customers and taking direction from their input. We’ve made significant improvements over the last few months based on that feedback; our customers really have shaped this product with us! Of course, there is so much more we can do and we’re not done taking feedback, in fact—we’ll always continue to listen! Today, we are excited to address a very popular request by announcing the start of Sway’s rollout to Office 365 business and education subscribers! We’ve always believed that Sway’s promise—making it simple to create and share polished, professionally designed, interactive content—would appeal to professionals, educators and students. 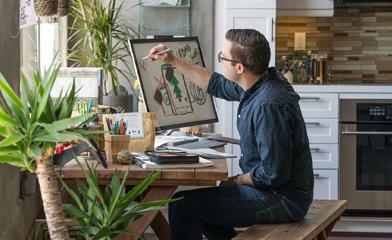 In fact, we’ve already seen many educators using Sway in really creative ways during Preview. We’ve also added features relevant to business and education customers—including simultaneous coauthoring, creating interactive charts, embedding Office documents (such as Excel charts and graphs) and more—all while crafting the basics of the Sway experience to be tighter and smoother. Later this month, Sway will support Office 365 work and school credentials, meaning all qualified* Office 365 for business or education subscribers can start Swaying, too! Sway for Office 365 will be available to First Release customers initially, and then we will roll out Sway to all eligible Office 365 customers over the coming months. Both Sway on the web and the next Sway for iPhone update will support logging in with Office 365 work or school accounts. 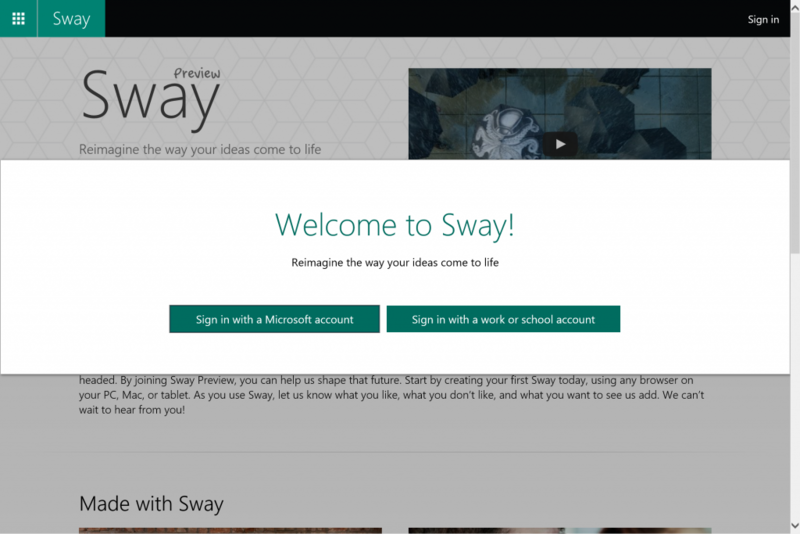 Sway will soon allow you to log in using an Office 365 work or school account. The interface may vary when available. What’s different about the Office 365 version of Sway versus the consumer (Microsoft account) version? Content sources in the Insert tab will be optimized for Office 365—We’re evaluating which sources make sense for Office 365 users to access in order to easily pull together their multimedia content right within the app. For example, we’ll be replacing consumer OneDrive with OneDrive for Business and ultimately, Facebook with Delve. We’ll continue to tune that set of sources in Sway for Office 365 based on customer feedback. Sways are private to your organization by default—Office 365 users will see a fourth option called My organization under the Share button, which requires that viewers are logged in with credentials from your organization to see the Sway. My organization will be the default setting for all new Sways in Sway for Office 365. It is still possible to make Sways (such as product brochures, newsletters or class projects) accessible to those outside your organization by choosing either People with the link or Public as the sharing setting. Sharing to consumer social networks is more intentional—We’ve heard from Office 365 customers that they would like to make sharing organizational content to consumer social networks more intentional, so we’ve removed those buttons from the top level of the product. You can still share to social media (say, if you’re a marketer sharing a company brochure) if you change the sharing level to People with the link or Public and then copy/paste the link directly to the social network. Office 365 Admins can control the experience—Initially, admins will have some basic controls over Sway: the ability to turn off the Sway service and to disable external sharing at the organizational level. We’ll continue to grow the list of admin controls over time, using our extensive experience in understanding and accommodating admin control requests. 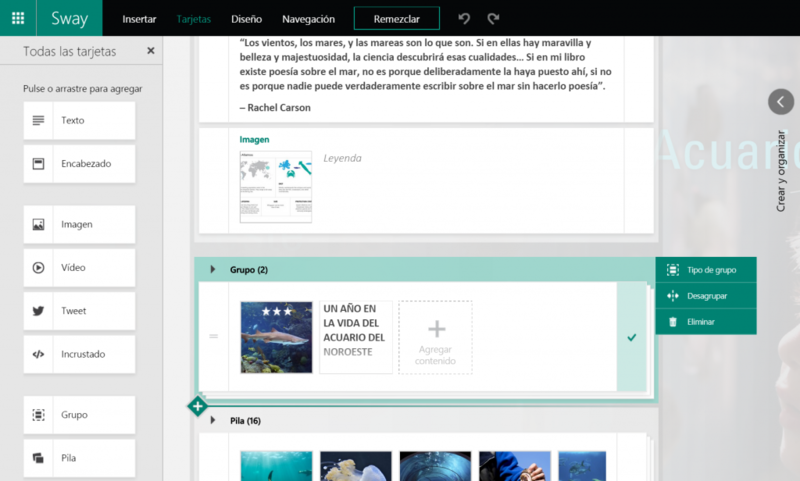 How should business and education customers use Sway? Professionals will be able to use Sway to save time at work and easily create engaging, eye-catching interactive reports, presentations, and more which flow responsively across all device types. For example, marketing plans/campaigns, blogs, proposals and sales pitches, project plans/updates, brochures/digital fliers, newsletters, weekly/monthly/quarterly/annual reports, training manuals, and so much more. Why make a boring PDF that is hard to read on a phone when you can make a Sway? 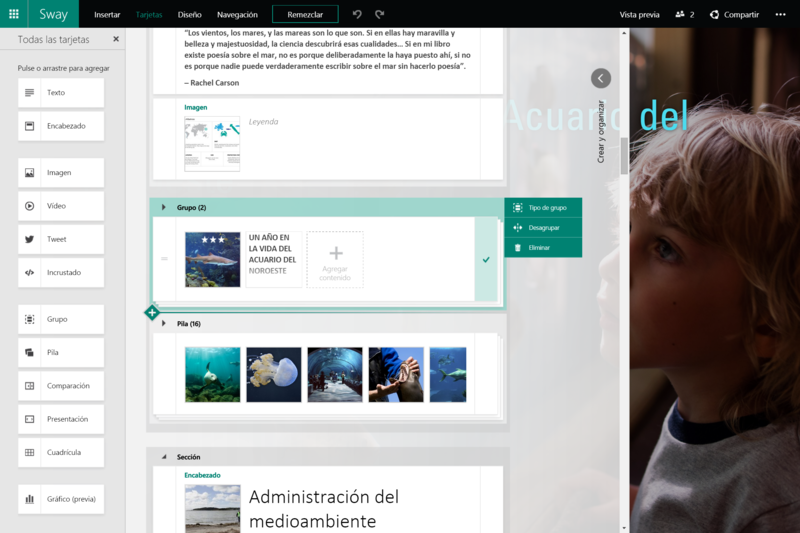 In education, teachers can use Sway to engage students by creating and sharing interactive lessons and study guides, field trip reports, assignments and class project recaps, which they can also share easily with parents. Many teachers also document their best teaching practices with Sway and share them with colleagues. Students can have fun while learning and stay engaged by using Sway to breathe new life into reports, assignments, projects, study materials, and portfolios. Sway.com has been accessible worldwide without restriction during Preview, and we’ve seen some great Sways written in non-English languages. But the Sway user interface has only been available in English, and we want to deliver the Sway experience to users worldwide in their language. This quarter Sway.com and Sway for iPhone will support more language versions, for both consumers and Office 365 business and education users. We’ll initially support Dutch, French, German, Italian, Japanese, Portuguese and Spanish, with more coming soon. Sway will begin rolling out local language support to the user interface this quarter. Keep the feedback coming and we’ll keep working to improve and expand Sway’s set of capabilities. Today’s announcements will make Sway available to an even broader set of people in organizations and around the world. We’re excited to have you come Sway with us! *Sway will be available to customers (initially in First Release) with subscriptions to the following SKUs: Office 365 E4, Office 365 E3, Office 365 E1, Office 365 ProPlus, Office 365 Business, Office 365 Business Premium, Office 365 Business Essentials, Office 365 OneDrive for Business, Office 365 Small Business, Office 365 Small Business Premium, Office 365 Midsize Business, Office 365 EDU E4, Office 365 EDU E3, Office 365 EDU E1, or Office 365 EDU ProPlus.